Ford (s f) today launched the AppLink software for its 2011 Fiesta car that links a smartphone with Ford’s voice-activated SYNC system. With Ford’s SYNC AppLink installed in a car, a driver can control specific third-party applications on a nearby smartphone by speaking to the automobile. AppLink will initially support three smartphone apps on Apple’s iOS (s aapl), Google’s Android (s goog) and Research in Motion’s BlackBerry (s rimm) platforms, with additional applications expected to be compatible with AppLink in the future. Linking phones with cars is nothing new; since many municipalities are creating hands-free laws for safety, the availability of Bluetooth support in an automobile is becoming commonplace. But Ford’s AppLink isn’t a simple built-in Bluetooth connection for hands-free phone conversations and contact dialing. Instead, AppLink is actually installed to the SYNC system by a consumer, which may be a first. Ford is creating a platform with SYNC, one that developers can leverage when creating smartphone applications. Getting cars to control smartphone apps through speech recognition like this ought to be appealing. According to a Consumer Electronics Association survey, 55 percent of smartphone owners prefer voice commands as their user interface for in-car smartphone integration. Aside from the consumer desire and benefits of intelligent, safe, voice-activated smartphone apps through a system capable of recognizing over 10,000 first-level Ford SYNC commands, developers stand to win as well. In April of this year, Ford detailed plans for the AppLink APIs, and I suggested then that smartphone apps that use them could offer a value-add against competing apps that don’t integrate with an automobile. Consumers that can easily link Pandora with a car and control it through the SYNC voice system, for example, might be more apt to choose Pandora over Slacker, Rhapsody or some other media streaming application. 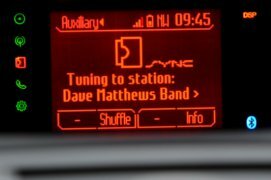 Developers can’t overlook the fact that this type of market offers a large opportunity: More than 2 million Ford vehicles have the current SYNC system and while only the 2011 Fiesta currently supports AppLink, Ford is sure to keep its foot on the gas pedal and add to the list of models that can work with smartphones in the future.